Most folk with whom I associate believe as I do that we just could be the generation that will be around when Jesus returns. The generation before mine and the generation before that and preceding generations going back to the days Jesus walked the earth have also said this. Many foolish things have been said and done in this time but it does not negate this event in any way. Jesus told us many times that He would return and so He shall. His disciples wanted to know about such matters. As they were departing from the Temple area, they pointed the buildings out to Him, but He said that it would all be thrown down. When they were in private, they asked Him about His return. As Jesus left the temple courtyard and was walking away, his disciples came to him. They proudly pointed out to him the temple buildings. Jesus said to them, “You see all these buildings, don't you? I can guarantee this truth: Not one of these stones will be left on top of another. Each one will be torn down.” As Jesus was sitting on the Mount of Olives, his disciples came to him privately and said, “Tell us, when will this happen? What will be the sign that you are coming again, and when will the world come to an end?” Jesus answered them, “Be careful not to let anyone deceive you. Matthew 24:1-4. His reply started with a warning not to allow anyone to deceive them. The bible teaches us in such places as 2 Timothy 3:1-9 about deception in the last days, so it is good to heed the warning. If you are in doubt about things people are telling you, check their stand on the Lordship of Jesus Christ. Ask them about His shed blood and physical resurrection. Enquire into their belief regarding His divinity. You can soon tell the genuine. If the person says that He was a great prophet (which He was), but deny His divinity, avoid them! If they do not place much emphasis on the efficacy of his atoning blood, then warning bells should be sounding. What I wish to get to however, relates to the signs of His coming. He said that there would be wars and rumours of wars, but that is not the time. He said that there would be earthquakes and we are witnessing an increase in earthquakes, tsunamis and other natural disasters, but they are not the determining factors. He told us to look at two things — Israel and the Church. Now learn this parable from the fig tree: As soon as its branch becomes tender and sprouts leaves, you know that summer is near. In the same way, when you see all these things, recognize that He is near—at the door! I assure you: This generation will certainly not pass away until all these things take place. Heaven and earth will pass away, but My words will never pass away. Matthew 24:32-35. If you liken Israel to the fig tree, then this is a very good indicator. In 1948, the Nation of Israel was re-born. No other nation on earth has ever had such a thing happen to it. I was born in 1942, so this happened in my lifetime. And this gospel of the kingdom shall be preached in all the world for a witness unto all nations; and then shall the end come. Matthew 24:14. Jesus said that the generation that witnessed these things happening would not pass away until all the things He spoke about happened and He returned. This Good News about the kingdom will be spread throughout the world as a testimony to all nations. Then the end will come. Matthew 24:14 (emphasis mine). Please notice that He said that it is the Gospel of the Kingdom... not another gospel and not a denominational message of any kind. Paul said that if anyone preaches a different message he is accursed! see Galatians 1:8-9. That's heavy stuff. It behoves us to ensure that we are preaching Christ and Him crucified. And I, brethren, when I came to you, came not with excellency of speech or of wisdom, declaring unto you the testimony of God. For I determined not to know any thing among you, save Jesus Christ, and him crucified. And I was with you in weakness, and in fear, and in much trembling. And my speech and my preaching was not with enticing words of man's wisdom, but in demonstration of the Spirit and of power: That your faith should not stand in the wisdom of men, but in the power of God. 1 Corinthians 2:1-5. Sadly far to much is made of everything but what Paul said. Traditions of men have watered down the truth so much it is hardly recognisable any longer. One reason for the preaching of the Gospel is to establish a testimony or witness. Jesus did not tell us that the world would necessarily accept it, but that there would be no excuse by anyone in saying that they never heard! One of the purposes for the Church is to reveal the Manifest Wisdom of God. See Ephesians 3:8-12. The word Nations in the original is Ethnos, from which we derive the word Ethnic. It generally speaks about non-Jewish people, but also relates to various tribes and groups of people scattered over the face of the earth. I have personally witnessed signs of this in my travels. I was taken to a place for ministry during one of my crusades to a region that my hosts called “remote tribes” and I was The First Foreigner to have ever visited that part of the particular country I was visiting! On my return to the main city late at night, whilst still out in the bush, I saw a building beside the road where a small crowd of people gathered around a television receiver. I could see a satellite dish in silhouette against the sky and they were watching the God Channel — a Christian channel and the Gospel was being preached! The Lord told me that this is what He referred to in Matthew. I am absolutely convinced that I am living in the last of the last days. Certain folk say that we don’t know when He is returning. I once thought that, but we will know! Yes… we will know. It might not be to the split second as regards time, but we will know the season. 1 Chronicles 12:32 tells us that the Children of Issachar know how to discern the seasons in God. Few people today bother to check. Anyone can tell when winter has arrived, when snow starts falling. Anyone can tell a change in season has arrived when spring flowers start to blossom. Anyone who is observing things in the spirit can similarly tell that a change in the spiritual season has arrived and this change is happening right now! You may ask me, How do I know that? There are several very good reasons as follows. One of the most powerful illustrations the Lord showed me about the timing factor is found in Matthew 25, when Jesus was speaking about end time events. Do not confuse things as often happens. End time events take a multitude of various aspects and they are not necessarily all to do with the Church. God speaks to three groups of people, namely the Jews who have a covenant with God that has never been annulled. God deals also with the Church in the New Covenant. The Church has not replaced the Jew as erroneous replacement theology teaches. They are treated differently. The third group of people is the people who have no relationship with God at all. The bible says that these people belong in the world, or the world system. Jesus was speaking about a wide range of events in these closing chapters of Matthew. If you are a blood washed believer, then some things relate to you and others do not. If you are Jewish, the same principles apply. God deals with you in a different way to how He deals with the non-Jewish believer. Regardless… we are all blessed because of Father Abraham! Look with me now at this story. And the foolish said unto the wise, Give us of your oil; for our lamps are gone out. But the wise answered, saying, Not so; lest there be not enough for us and you: but go ye rather to them that sell, and buy for yourselves. Watch therefore, for ye know neither the day nor the hour wherein the Son of man cometh. Matthew 25:1-13. When people try to tell you that no one knows when Jesus is coming back, they are only partially correct, but mostly talking without understanding. In this story, ten women were about to be married. In my society as with many others the couple meet and fall in love. The man asks the woman to marry him and they are then engaged to be married. Marjorie and I set a date for our wedding, just as any other couple does. We spoke with the minister, so we had an appointment at a set date and time to discuss the wedding with him. We chose the time for the service. We chose a photographer to take wedding photographs. We chose a limousine to bring Marge to the Church and take us both elsewhere afterwards. We arranged for a wedding cake, a wedding breakfast and for bouquets of flowers. We arranged a honeymoon, which also means that we know the dates and time. Don’t try to tell me we didn’t know when we were going to get married! I put it to you that those ten ladies knew! The family discussions took place. The bride price and dowry etc was paid and all the arrangements that were to be made were made! Those ladies knew alright! Jesus told us that His Father’s house contains any mansions. He said that He was going to prepare A Place for us so that Where he was… We would also be there as well! Let not your heart be troubled: ye believe in God, believe also in me. In my Father's house are many mansions: if it were not so, I would have told you. I go to prepare a place for you. And if I go and prepare a place for you, I will come again, and receive you unto myself; that where I am, there ye may be also. John 14:1-3 (emphasis mine). The bridegroom was preparing a place for his wife! They knew it. When he was ready, he and his friends would walk down the street of town in a procession accompanied with mirth and merriment, music and laughter. It was a joyful occasion. Jesus told us that ALL TEN of them fell asleep. They were waiting to go and five of them neglected to top up their oil lamps. The other five did at least take some oil, but not enough. They were all unprepared. Whilst they were sleeping the bridegroom arrived. Someone called out, He’s here. Go out to meet him. All ten of the virgins then awoke and tried to light their lamps. Five had completely run out. The other five had allowed their oil to get so low they doubted if they would have enough for themselves! What an indictment. All of them had said, Yes I will marry you and now fell asleep, were not prepared and didn’t even hear the noise of the approaching bridegroom with his entourage. 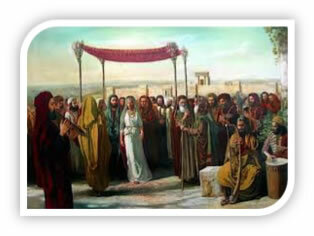 When the bridegroom arrived, he went into the appointed place—with all of those who accompanied him! Only those people who were ready got inside and the door was shut! After the door was shut, the five virgins who were still in the building tried to get inside the place where the bridegroom was to be found. They asked him to open the door and he refused. They had blown it and he in essence said, Who are you. I don’t know you. Now wait a minute, were they not engaged to be married? Yes! Did they not know what was to happen? Yes! This is what rattled my cage somewhat. The Lord asked me a simple question, Which group of people would you prefer to be with? I immediately answered according to my traditional teaching of the past, Oh… one of the five wise virgins! Wise? They were dumb! He asked me, Who told them that the bridegroom had arrived? I then saw that it was the watchman. Perhaps only one person was alert, tuned in and looking for the approach of the bridegroom. As soon as he turned around the corner down the end of the street, he called out. He’s here! The Lord then asked me, Wouldn’t you rather be the watchman? Oh yes… I saw what He meant at last. This might sound harsh, but sadly most of the church is either asleep or lazy, or just plain dumb. Oh Robert, you say, We said the sinner’s prayer! That’s great, but are you watching and waiting? We tithe, go to church every Sunday and support ministries. That is also commendable, but are you one of those who used up all their oil and ran out of time? We are all but living on borrowed time and there is a change happening. Jesus is at the door! He does not want anyone to miss the boat, but as I told folk in my church once, I do not want you to get to the wharf and the ship has sailed and disappeared over the horizon. Someone has to tell us that things are changing. This is one aspect of the Changing of the guard and I am saying that we no longer have the luxury of sleeping in and doping off, or of playing church games, because Jesus is like that bridegroom walking down the street. We may not know the precise day or time to the second, but we will at least know the season! Part of the work that precedes Jesus’ return is, I believe, a kind of literal changing of the guard. There are definite seasons in nature, or Spring, Summer, Autumn and winter. Each season differs from the other and in the plant kingdom changes occur just as God intended when He created everything. I like stone fruits. Cherries, peaches, nectarines, plums are my favourites, but the fruit is only found in summer time. In autumn, the leaves begin to fall off the trees. In winter, they can look like dead sticks, but in spring...ahhh, spring… flowers start to appear signalling new life. Without such changes, we would not enjoy those sweet, juicy morsels. I am convinced that in Gods spiritual seasons, similar things happen. The feasts of Israel were seasonal, so why not things relating to the spirit? Jesus’ birth was like that. Throughout the bible, I see a principle likened to a changing of the guard and will touch on this, citing several champions of the faith in scripture. In Genesis chapter 12:1-4, God instructed Abram when he was 75 years of age to leave everything that was near and dear to him and move to the place of His appointment. After Lot’s departure in Genesis 13:14, God started to reveal His plan, that included posterity (Genesis 13:15). Thirteen years later, after the incident that let to Ishmael’s birth, God started speaking again. He had been silent for 13 years! The covenant was renewed by God. Abraham had effectually broken that first one with his involvement with Hagar. He said, when Abram was 99 years old that he was making a covenant that said he would be the father of many nations and changed the man’s name from Abram to Abraham. See Genesis 17:1-9. We now know that Abraham, became the father of Isaac, who became the father of Jacob who became the father of the tribes of Israel. There was a natural progression of father to son whereby the inheritance passed down the generational line. In a manner of speaking this could be a kind of changing of the guard. Exodus 2:1-2 gives the account of Moses’ birth. A new season was about to begin and in Exodus 12, Moses led God’s people into a new era. At that point, the Hebrew calendar changed and a new beginning commenced. Forty years later, another new beginning was about to commence. Moses’ life comprised three distinct periods of time, each of 40 years duration. The number 40 is associated with a period of probation, trial, and chastisement. It is the product of 5 (representing grace) and 8 (representing revival and renewal). In Joshua 1:1-2, God told Joshua that Moses was dead. In essence, another changing of the guard was about to happen. What God had done with Moses was coming to a close and a new leader was to emerge. Joshua had been in training for 40 years. We do not see much of his activities previously. We first see him in Exodus 17:9 when Moses told Joshua to choose men and fight the Amelekites. Where did Joshua come from? Why did Moses pick him? The future leader of the nation of Israel...the man who was to take God’s people into their Promised Land was a servant to the man of God. Herein is a very important principle. Good leaders...and I mean really great leaders come at the right time, in the right place, for the right purposes and most times only emerge after much prior preparation. I shall elaborate more as we continue. We take up the story in 1 Kings 17 where the prophet Elijah is first seen. Other than saying he was a Tishbite, he seems to be a mystery man. I do not know where he came from or what he had previously done, but he suddenly emerged as if out of nowhere and went straight into action. I urge you to read 1 Kings chapters 17 and 18, but now look at 1 Kings 18:42-43. Here, he prays for rain and told his servant to look for it. The servants name is not mentioned! I am of the opinion that this is Elisha. When Jezebel threatened him, Elijah fled to Beersheba ad abandoned his servant! He traveled a day’s journey into the wilderness where God ministered to him and here instructed Elijah to anoint Elisha to take over! In 2 Kings 2, Elijah was taken up in the chariot of fire and Elisha picked up his mantle. Please note that Elisha was already anointed! He took on Elisha’s anointing as well.This was a changing of the guard! Turn with me to 2 Kings 13:14-21. This is the account of Elisha’s terminal illness. In the account, he wanted to pass the anointing on and unfortunately did not succeed. The man who could have been the recipient missed the opportunity. His faith level was not up to par. His commitment was not as good as it could have been or should have been, with the result that he died before passing the anointing on. On this occasion, there was no changing of the guard. Luke chapter one describes the birth of John. Luke 1:17 declares that John would pave the way for the coming Messiah. Matthew 3:1-3 says that John came as the man who would prepare the way of the Lord. Without going into too much detail, John’s task was fulfilled when Jesus started His ministry. He actually told most of his disciples to follow Jesus. He said that he had to decrease so that Jesus could increase. When Jesus started His ministry, a changing of the guard occurred. His ministry needs no elaboration here. He went about doing good, healing the sick, preaching and teaching about the kingdom of God and trained a group of people to take over His ministry. He started with 12, then 70, then on the Day of Pentecost, 120 people gathered together and from Paul’s saying in 1 Corinthians 15:6, there were 500 brethren. His commission is seen in Matthew 28:18-20; Mark 16:15-20 and John 20:21. Church history reveals how His mantle had been picked up by people like you and me and so it continues. This brings us to our generation. If there really is a biblical principle as previously outlined, we need to see how it could affect us. There are many fathers of the faith who are role models...men and women who have pioneered works and moves of God over the generations. You can conduct searches of your own to see some of them. Every one had an input into the Church. Obviously not all they said and did has been carried on in the spirit in which it was originally given, but they did make a contribution. I will focus more on some of the more recent leaders I know. The man who had a major impact on my life was Kenneth Hagin. I was fortunate to spend a week of ministry with him in Australia back in the 1970 era. It was during that time, the seed of what is now Bashan Ministries was planted. As you know, there are no instant success stories. To be best of my understanding, every one of the leaders I have mentioned all spent a considerable time in proper preparation before launching out into their ministries. I’ve touched on the 40 year periods of Moses’ life; the servanthood of Joshua and Elisha before and it seems that this is how God prepares His generals. No one enters the military and immediately sits behind the desk of a general. Boot camp comes first. Then there are periods of additional training and promotions unit they are promoted to higher positions. In my secular career, I joined the PMG department in Australia as a telecommunications technician as an apprentice. After that training, I studied and was promoted to a Senior Technician position. Then came terms of officer in charge of various workplaces (mostly on relief work) and then came the day when I was promoted to the assistant technical manager of a very large district with some 250 operational staff. When I finally left what became Telecom then Telstra, I was the National Administrator of an arm of the project that computerized Australia’s telephone exchange network. The point I am making is that this took time in which I had to learn things, mature in areas, accept responsibility and generally prove myself. I believe that this is like what is needed in the Church. Paul told Timothy not to appoint a novice to a position of responsibility. A pimply faced bible college graduate really should not be the pastor of a church for example. We expect that after some maturity and experience he could become the senior ministry of a good bible believing church. Kenneth Hagin went home to be with the Lord along time ago but his legacy has been passed down chains of command to others. Perhaps some of that rubbed off onto me. Oral Roberts was another general. He mentored others like Kenneth Copeland, who in turn mentors others. Brother Roberts has also gone home. His legacy is also continuing. My mentor is Pastor Bill Winston from Chicago. In 2015, I transferred my ordination to him and in essence sit under his ministry. Although I am an independent non denominational ministry, I relate to him and I am finding that his banner or anointing is also coming over me. In my turn, I mentor others around the world. Some have asked me to be their Bishop. Some have asked to join my organisation. Should Kenneth Copeland, who mentors my mentor, go home, he will leave a legacy to others down the line. If Doctor Bill Winston also go, I suppose that his son David will pick up the mantle and keep the ministry running. I also hope that some of the BWM anointing will come on me. This is an aspect of the changing of the guard. I will hasten to add that I use this for illustration purposes only. I am not planning to leave yet and I believe that I will still be around when Jesus comes back. What people like Bill Winston and I are doing is training people like you. This is a very important part of my whole ministry. This web site is devoted to teaching. Training others to take over, is preparing them for a changing of the guard if occasion dictates. If not, we are nevertheless doing what Paul said. Training others, or preparing to pass the baton on to others is precisely what I mean. It is a progressive unfolding of God’ revelation. He wants the Church to reveal His manifold wisdom to principalities and powers. He wants the church to grow to full maturity. I see that there is still much work to do in such areas. Notice that it says “he ascended.” This clearly means that Christ also descended to our lowly world. And the same one who descended is the one who ascended higher than all the heavens, so that he might fill the entire universe with himself. Previous generations never entered into this. Some never saw it. The word of God is complete and we cannot add to it or detract from it, but we have not really seen it. We haven’t really had the revelation of what it means. I believe that when the Church does grasp such truths, we will have reached that stage of maturity and Jesus can then come. Perhaps there will be more changing of the guard, but what if...what if the last changing of the guard was the last we will ever have?